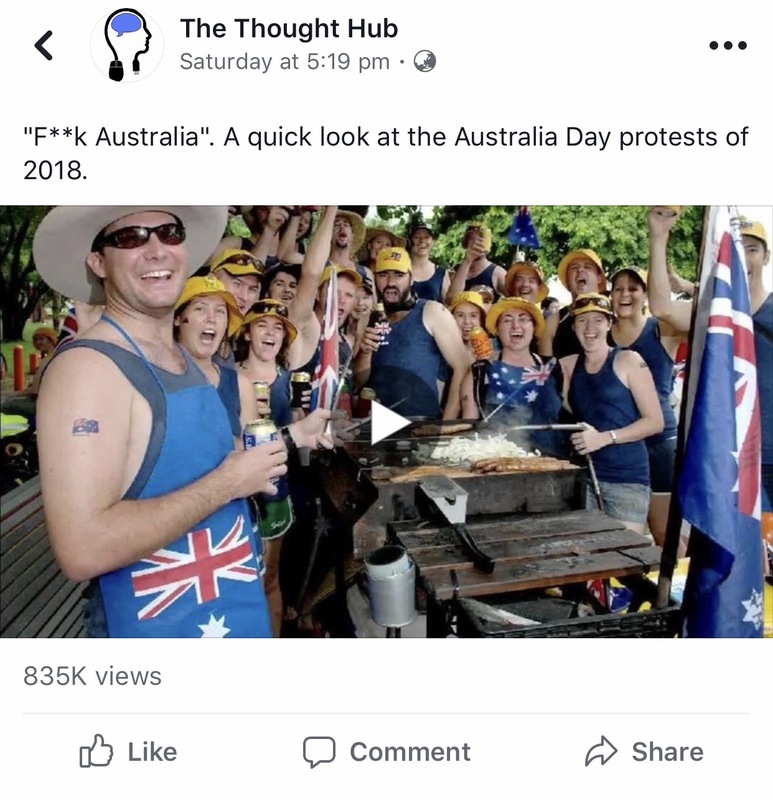 At 1pm today, after over 20,000 shares and 835,000 views, I decided to take down the video featuring protesters on Australia Day. For someone who fiercely defends free speech and the right to voice unpopular views, this was not a decision taken lightly. However, moments arrive when you must ask if your action is a force for good, and if the answer is negative then you must consider why. I often criticise my opponents, usually on the political left, for allowing the intention of their actions to cloud their assessment of the consequences. My intention was to provide a commentary on what I still believe to be the disgraceful actions of Australia Day protesters. Indeed, Tarneen Onus Williams and her behavior was deplorable, along with others. It was also to point out that the peaceful majority of Australians enjoyed the day for what it was intended, and that we have much to be proud of in this country. The consequence, however, was that it unleashed a monster, a torrent of racial and sexist hatred that was astounding in its depravity. When the intention was to call out an individual and wider group for their divisive remarks, one really must consider what one’s action will be when they created a platform for the expression of something worse. Robust debate about contentious issues is inherently desirable, but there is absolutely no place for the sort of vile abuse that populated this site’s thread. Comments calling for Williams to be hanged or to be roasted on a spit are not free speech; they are disgusting, dangerous and outright horrendous. Such comments contribute nothing constructive to debate. They only exacerbate hate, the very thing the original video called the demonstrators out for in the first place. It is not free speech to call for people to be killed. It is not free speech to call for a second genocide. It is bile. I am not personally responsible for the comments individuals make, but I am responsible for the platform on which they are expressed. If that platform is serving to further incite the sort of hatred it tried to denounce in the first place, then the best course of action is to remove the content that is causing people to be their worst selves. The division in this country will not be healed by the likes of Tarneen Onus Williams or the hate filled comments about her. Both should not be given a platform to express hate, because it ultimately does little good. That is why the video was removed. As is always the case, there were many contributions that were impassioned, but reasonable. Unfortunately, they get drowned out by the extreme, and it’s the extreme that draws the most attention. I stand by the original editorial stance of the video. Its essence being that hateful, divisive and ignorant actions should be denounced and called out for what they are. It’s on such a principle that I will apply the same treatment to those individuals who sunk even further. Let it be clear, your hate is not welcome.